I took a fuzzy little black feather boa that I got at Michael’s or Joann’s, cut it up, and attached it to the top and bottom edges of the lampshades with double stick tape. It Halloweens up the place. I think they help the over-all look of the buffet. 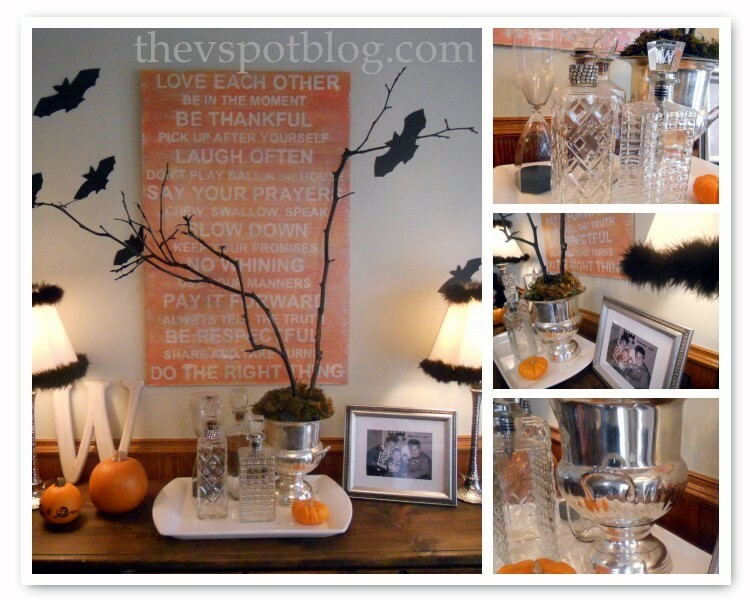 I love the vintage decanters and the champagne bucket, and of course, black sticks. You know what else I love about this vignette? Decorating with old Halloween photos. This one is from Grant’s first Halloween. What a Tubba Bubba!! It makes me smile every time I see it. Nicely done with the black boa! Love the champagne bucket too! Look at that sweet Grant!!! I was just wondering what I could do to my lamp! I need to frame our old Halloween pictures too. Great idea! Awww, that tubba bubba is adorable! I always set out an old picture too. One of the girls jumping into a pile of leaves for Fall, one of them dressed like little girls not skanks for Halloween and for Christmas I have a shelf designated to hold every picture from every Christmas card that I have, I think it goes back to 1999. The lamp is perfection, how could ya fault that? My fav vignette so far. Love it!! Those lampshades look very hot to trot now! 🙂 Cracking up about the leg lamp from A Christmas Story! 🙂 Your entire buffet looks so wonderful Viv and I love the champagne bucket with the black sticks. love the lampshades. and it’s not bad to have just once vice (ie. changing lampshades) or two or three. can’t wait to see all your seasonal shades! So clever to change up your lampshades! They go perfectly on your buffet, which looks amazing!! I’ve never even thought of using old Halloween photos of my boys to decorate. I’m a bit dumb, but thank goodness I know brilliant people like you! I’ve got some pirates and soldiers who are just begging to be displayed! WHAT? I’m supposed to change out my lamp shades for each season? I’ve never changed them in the 3 years I’ve lived at this house. And I don’t have an adorable Halloween picture in a frame. THIS WILL END THIS YEAR! I will have one next year. Promise! Double stick tape – who’d thunk it? Only you Miss Viv- only you!! And you need to post more pics of that tubby baby!! So adorable!!! Very cool. I particular love the idea of decorating with halloween photos. Usually they just get put up in the albums. Great idea! Love the lamps they look awesome. I lurrrve the vintage decanters! Where do you get those things! You did a great job on this setup!!! I have just started following your blog – would love if you got a chance to check mine out too!